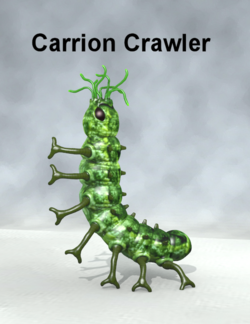 Carrion crawlers storngly resemble a cross between a giant green cutworm and a huge cephalopod. They are usually found only in subterranean areas. The carrion crawler is, at its name implies, a scavenger, but this does not preclude aggressive attacks upon living creatures. This is a figure. This page was last edited on 26 March 2019, at 20:20.